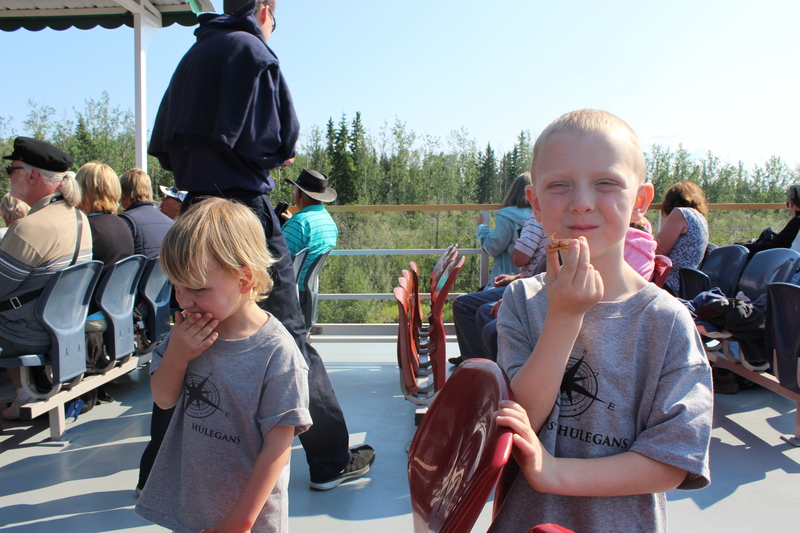 We had read in several different places that the Riverboat Discovery tour was not to be missed in Fairbanks, so we decided to take the advice of many travelers who have come before us, and take the tour. This is risky business. It’s not exactly top secret information that Alaska is not the number 1 family summer vacation destination, and most of our camping neighbors are more likely to have kids our age than our kids’ age. We have been very warmly received everywhere we’ve been so far, and our kids are generally very well-behaved, but the thought of getting on a boat for 3 hours, where we would probably be the only family around, caused me more than a little indigestion! It turned out that on 4 full levels, that’s right, 4 levels of the boat, we did, in fact, have the only kids. Thankfully, there were complimentary donuts…which we enjoyed on 2 levels of the boat, just to make sure we didn’t wear out our welcome at our own donut station. And that was just in the first 15 minutes! We hadn’t been underway for very long, when we had our first bit of excitement to watch. Part of the tour included a bush floatplane taking off and landing right off the side of the boat. We even got to hear the boat captain and the pilot chat about the flight! We cruised up the Chena River (sounds like Chi-nuh), and as we did the captain talked about life in Alaska today, described the homes we saw along the river, and explained a little about the weather (they get so little rain here in Fairbanks it can almost be classified as a desert, only 12″ per year!!) The next thing we knew, the boat slowed down then stopped, and we came to our next destination, Trail Breaker Kennels. 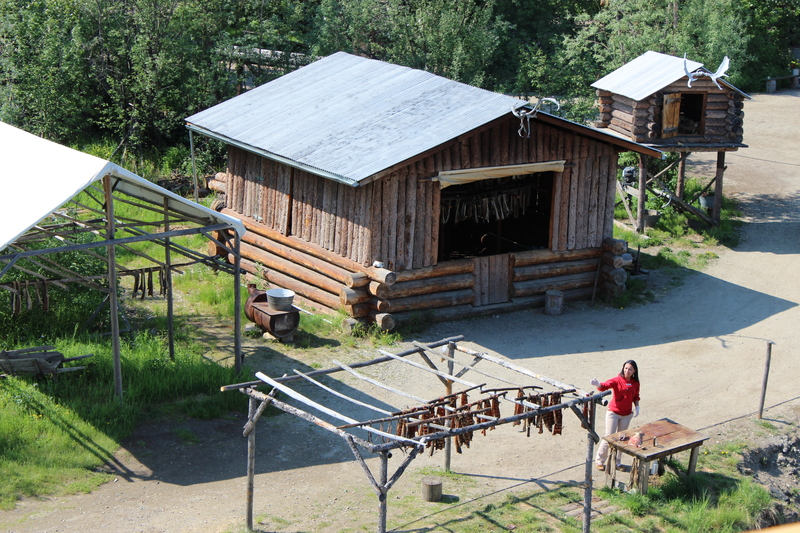 This is the home of the late, Susan Butcher; 4-time Iditarod winner and only the 2nd female ever to win. She and her dog, Granite, brought a lot of attention and recognition to the sport of dog mushing. Her inspiring children’s book, Granite, tells the story of how they became such a beloved team, and is worthy of a read! Susan passed away in 2006, after a brief battle with Leukemia, but her husband Dave Monson, and their 2 daughters were there to give us a great demonstration! This fur parka took 6 1/2 months to make and is valued at over $30,000!! The red parka Ashlee is wearing would traditionally be made out of tanned hide and worn in warmer summer months. We learned about the many kinds of animals that would be trapped and and how every bit and piece would be used for sustenance. 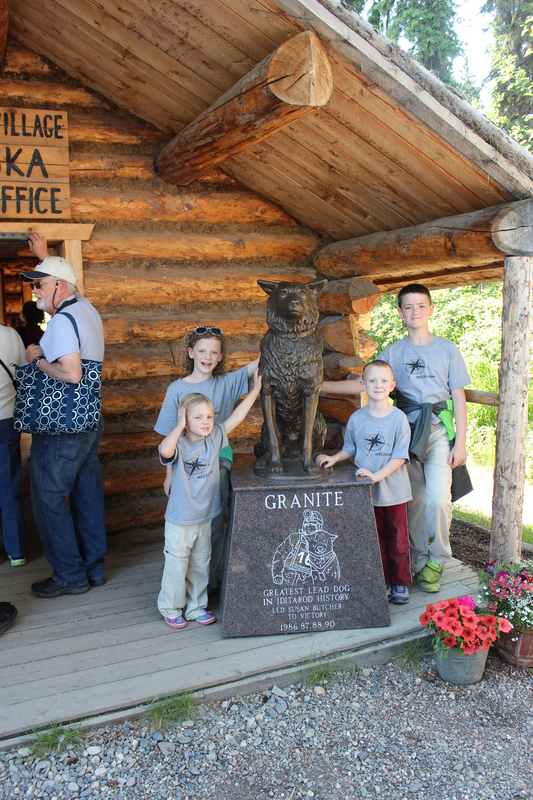 And we got to get our new book, Granite, signed by Dave Monson and visit with a few of the dogs from their kennels. So that’s how we do it….see the sights, have some fun, learn something new, and eat as many snacks as you can!! See you after the next adventure! Next Next post: Moose, and Caribou, and Bears! Oh MY!! !